Point Pleasant junior Dylan Tayengco hits a forehand shot during Friday’s second singles match against Sissonville at The Courts in Point Pleasant, W.Va.
Point Pleasant senior Olivia Martin hits a forehand shot during Friday’s third singles match against Sissonville at The Courts in Point Pleasant, W.Va.
POINT PLEASANT, W.Va. — A warm start to Spring Break. 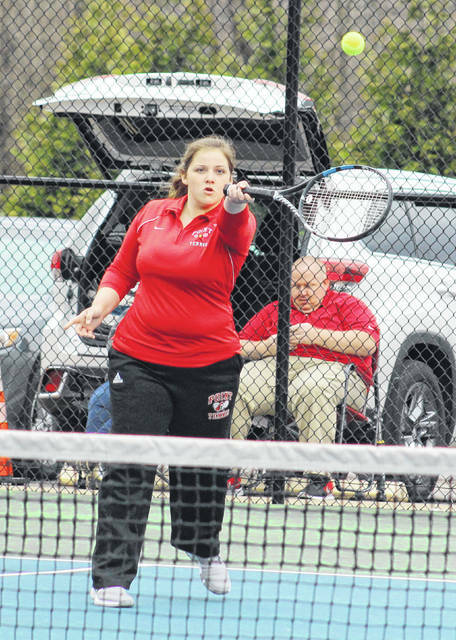 Both the Point Pleasant boys and girls tennis teams have winning records and winning streaks headed into a bit of a vacation after a quartet matches last week in various locations around the Mountaineer State. The Black Knights (6-1) shook off a 6-1 setback at Winfield on Monday by claiming a pair of home wins over Nitro (5-2) and Sissonville (7-0) on Tuesday and Friday. The boys match with Scott on Wednesday was a forfeit victory as SHS had only one competitor. The Lady Knights (5-3), on the other hand, won three straight matches against Nitro (6-1), Scott (5-2) and Sissonville (7-0) after falling below the .500 mark for the first time Monday with a 6-1 loss at Winfield. Caroline Foreman went 3-0 in second singles during the final three matches of the week, outscoring opponents 24-8 after a loss at WHS. Sarah Deem and Olivia Martin also went 2-1 overall in first and third singles play respectively after their setbacks on Monday. Grace Teichman was a perfect 3-0 at fourth singles after Monday, winning each event by an 8-2 count. Point’s only win at Winfield was a forfeit in third doubles, which was credited to Teichman and Paula Rodriguez. That tandem actually finished the week with a perfect mark after scoring another forfeit against Nitro after wins over Scott (8-3) and Sissonville (8-0). Deem and Foreman posted of trio of consecutive wins in first doubles, while the duo of Martin and Carlee Sang posted wins over Nitro (8-3) and Sissonville (8-2). The Black Knights also picked up a forfeit win at Winfield on Monday in third doubles, but that was their only positive claim on that evening. From there, Point Pleasant lost only two of the remaining 15 head-to-head matches played en route to a trio of victories. Dawson Wilson shook off an 8-0 loss to Winfield’s Jack Bowman by posting first singles wins of 8-3, 8-0 and 8-0 against Nitro, Scott and Sissonville. Luke Blain and Carson Chambers both went 2-0 against Nitro and Sissonville in third and fourth singles matches, respectively. 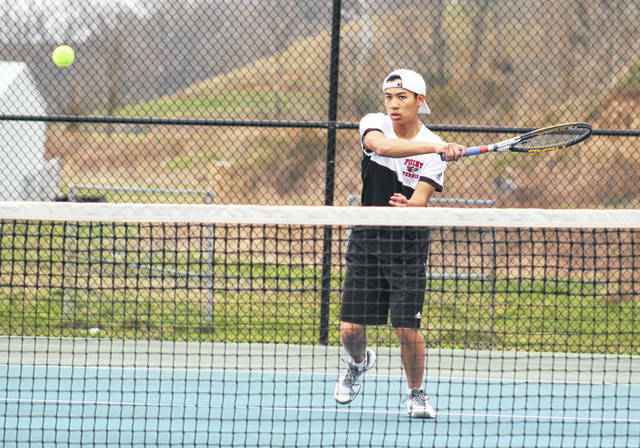 Dylan Tayengco went 1-1 after dropping a 9-7 tiebreaker against Nitro before rallying with an 8-0 victory against Sissonville. Wilson and Joel Foreman combine for a 2-0 mark in second doubles with wins of 8-2 and 8-0, while Tayengco and Blain posted an 8-0 win against Sissonville after falling against Nitro. Chambers and McKeehan Justus also posted wins of 8-2 and 8-0 on Wednesday and Friday. Point tennis returns to action Monday, April 8, when it travels to Poca for a non-conference match at 4:30 p.m.